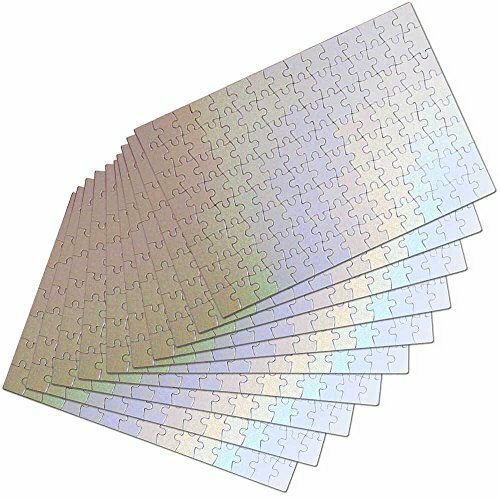 A4 Blank Sublimation puzzle Jigsaw( 10 Pcs ) Ref. : SFS- G02A4 Sizes : 11,4´´ x 7,4´´ inches ( 29 x 20 cm ) approx. Average Printable Size : 11,4´´ x 7,4´´ inches ( 29 x 20 cm ) approx. Press Temperature : 180 C ( 365 F ) Press Time : 60-80 seconds Weight : approx. 90 gr Average ( 10 x 90 = 1900 gr ) Color : White Packing : Individual White box packed 10 in an envelope DESCRIPTION : The A4 Blank Sublimation Puzzle is designed at an affordable price, it is suitable for business promotion or personal usage. You can print the image witch you like on the surface. NOTE : Any insert, photo or illustration shown in pictures are for demonstration purpose only and not included in the offer. Shipped : From USA. Dispached : 1 or 2 days after your payment is clear. Condition : Brand new, unused, unword ítem. You will received exactly as picture . A hard fabric surface with a sturdy cardboard bottom. If you have any questions about this product by SFS BLANK, contact us by completing and submitting the form below. If you are looking for a specif part number, please include it with your message.